In the field of aromatherapy, essential oils are used for things like relieving anxiety, helping to soothe an upset stomach, aiding in memory recall, and even for helping the skin to heal faster. They are a useful part of the natural medicine cabinet, for sure. While using essential oils, there are two very basic ways to apply them. “Neat” refers to the oil being placed directly on the skin, and “Diluted” refers to the oil being mixed in a base oil first. This base oil is what will be referred to as a “carrier” oil, since it carries the oil. There are VERY few times when an oil should be placed “neat” on the skin. Doing so can cause more harm than good, as there are oils that can burn the skin in full concentration. This can also lead to sensitizing the skin to the oil, and in some rare cases, can cause a future allergic reaction for the person. Once that happens, that person is no longer able to use the oil without a reaction. This can happen no matter how “pure” or “therapeutic” the “grade” of oil is. For a minor burn, a single drop of lavender applied directly on the skin would be one of the ONLY appropriate times to use an essential oil “neat”. The most common way to get the benefits of the essential oil when using inhalation therapy is by diffusing the oil, or by adding it to a necklace, or other jewelry. The benefits are realized without a drop of oil coming into direct contact with the skin. Get the DIY directions on how to make your own essential oil necklace HERE. When using essential oils on the skin for applications such as a compress, massage oil, or even in a relaxing bath, using a carrier oil is the ONLY way to ensure safety. As a general rule for healthy adults, a good dilution is 1-3% of the total oil. That means for every 100 drops of a carrier oil, only 1-3 drops of essential oil are used. For children, the dilution rate is even lower. To make the math easier, we are going to use 1 teaspoon=64 drops. So, if you want a 1% solution, you will use 1 1/2 teaspoons of carrier oil for every drop of essential oil. 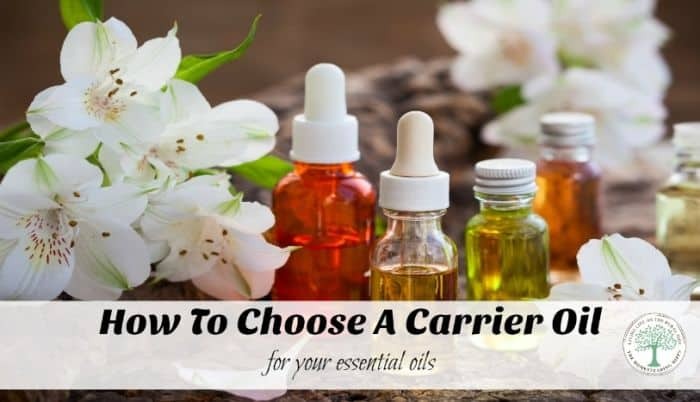 Knowing how to choose a carrier oil is important. Which carrier oil would you use most often? Be sure to pin this for later!